Egypt . Middle East . Attractions . Activities . Cairo . The Cairo Opera House is Egypt’s premiere performing arts center. This large opera complex opened in 1988 and houses seven theaters of varying sizes, as well as an art gallery, museum, and music library. In addition to opera, the center holds ballet performances, musicals, concerts, and plays. Its roomy Main Hall has room for 1200 patrons to enjoy opera, orchestral music, and ballet. Smaller theaters provide more intimate settings and excellent acoustics. The opera house serves as a hub for a number of companies in residence, such as the Cairo Symphony Orchestra, Cairo Opera Company, Cairo Opera Ballet Company, National Arab Music Ensemble, and Cairo Opera Choir. 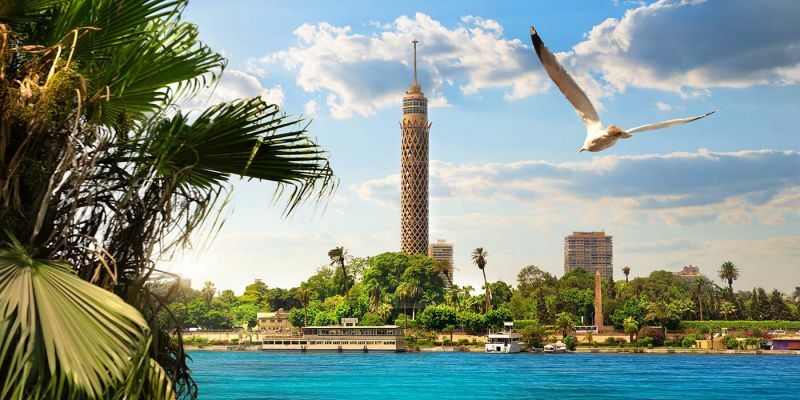 It is located in a tranquil setting amidst the manicured gardens of the National Egyptian Museum of Modern Art, on Gezira Island in the Nile. Dress up and enjoy a glamorous night out! 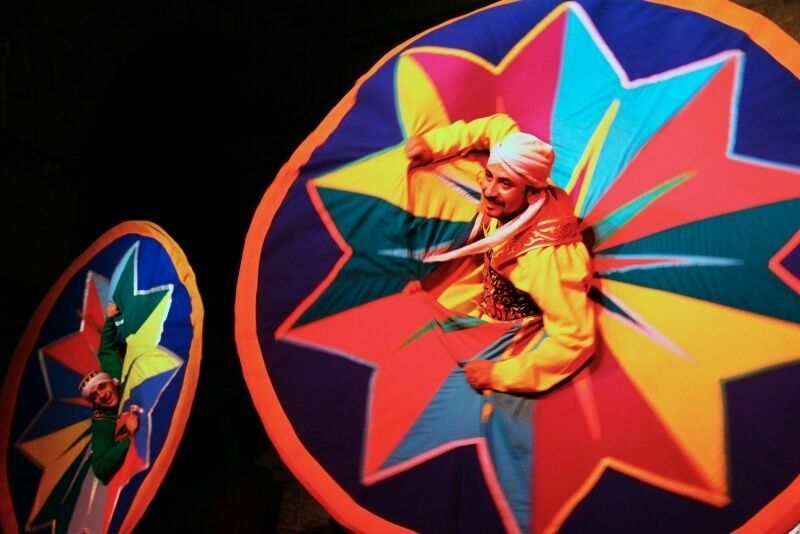 A true must-see while you’re in Cairo, Al-Tannoura dance troupe provides a spectacle for both your eyes and ears. Colorfully costumed performers show off their talents in song, music, and dance. This beautiful performance is like a moving meditation, showing you a spiritual and invigorating side of traditional Egyptian culture. Prepare to be mesmerized. 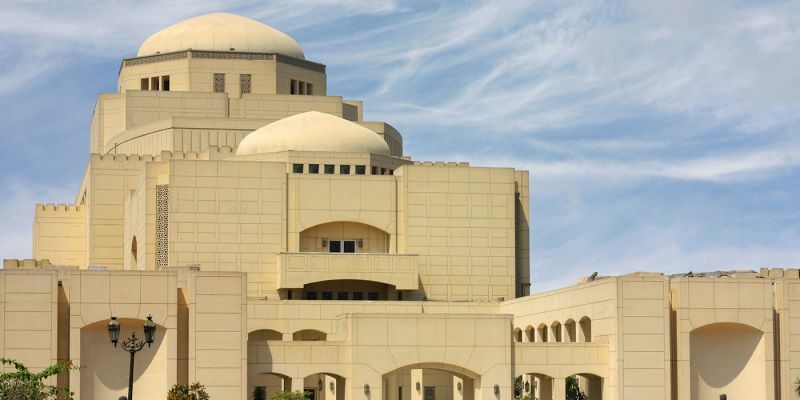 Located in central Cairo, the Wekalet El Ghouri Arts Center regularly hosts cultural events and shows, including performances by the Al-Tannoura Egyptian Heritage Dance Troupe. It makes for a stunning venue, thanks to its incredible architecture (dating back to 1504!) and atmosphere. Make sure to catch a show here if you get the chance. Feluccas are traditional wooden boats that people have sailed for centuries along the Nile. Consider for a moment how significant the Nile has been to the entire course of Egyptian history. Millennia ago, the Nile’s regular flooding patterns enabled the ancient Egyptians to cultivate the surrounding land. Egyptian society sprang up along the river, which nourished the growth of an astounding civilization. The Nile also plays a larger than life role in ancient Egyptian religion and mythology. On your trip to Egypt, you’ll likely arrive by plane and travel around the country by car—but take a moment to slow down and enjoy this slower, more traditional way of travel. 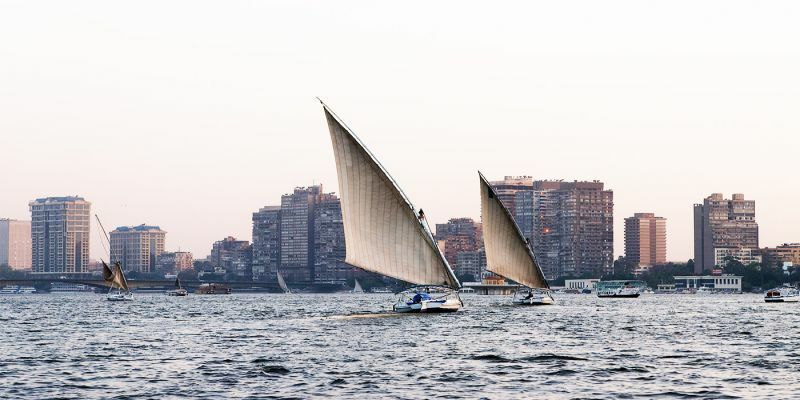 As you skim over the Nile waters in a felucca, you can experience for yourself what the Pharaohs themselves did when they traveled by boat. You’ll leave Egypt with a more concrete appreciation of (and participating in) its storied history. Admire Cairo’s illuminated skyline while enjoying dinner and a show. A dinner cruise down the Nile is the perfect way to unwind after a long and hectic day of sightseeing. Chefs prepare a sumptuous dinner from fresh ingredients, offering you a delicious introduction to Egyptian cuisine. 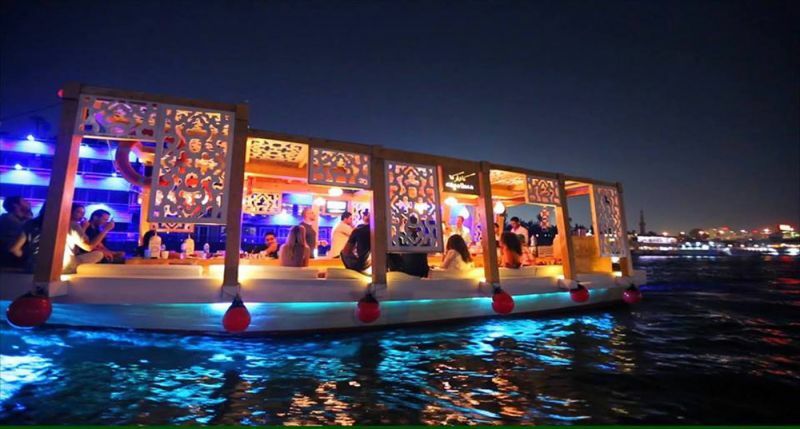 The Nile’s floating restaurants also feature top-notch entertainment: belly dancing, traditional music, folklore shows, and more. Dinner cruises are simultaneously relaxing and engaging, making them a vacation classic for a reason! Located in the heart of Islamic Cairo, this one-kilometer street contains an extraordinarily high concentration of medieval Islamic gems. Since 2008, the street has been designated as a pedestrian only zone, helping maintain its unique charm and character. 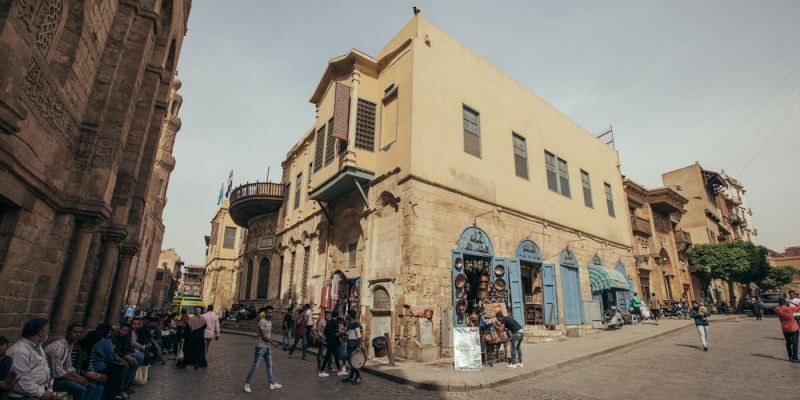 Your evening stroll down Muizz Street will take you past the Mosque of Al Hakim bi Amr Allah (built in 1013), the Mosque of al-Aqmar (built in 1125), the Complex of Qalawun (built in 1285), the Madrasa of Al-Nasir Muhammad (built in 1304), Qasr Bashtak (built in 1339), the Madrasa of Barquq (built in 1386), the Mausoleum of Sultan Al-Ghuri (built in 1505), and many, many more spectacular building of immense historical, cultural, and aesthetic significance. Bayt al-Suhaymi is one of many notable buildings on or near Muizz Street. This house, constructed in 1648, is a phenomenal example of Ottoman-era architecture and design. Latticed windows, marble floors, enamel tiles…This place will give you some interior design inspiration for your own home! 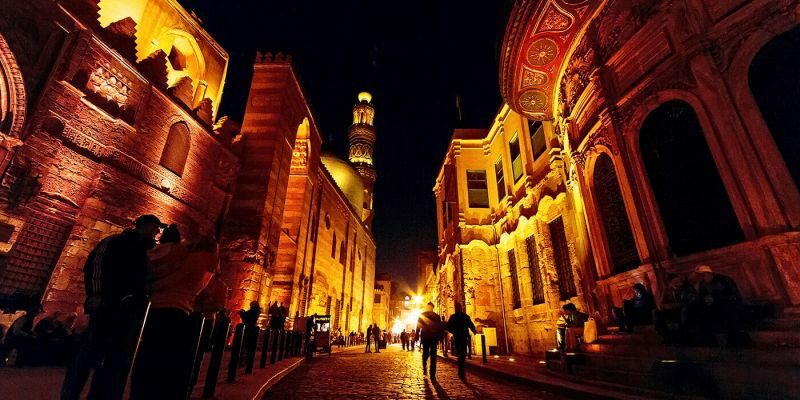 While Muizz Street is beautiful at any time, it becomes especially enchanting in the evening. If you’re in Cairo, you’ll of course want to enjoy pyramid tours and sphinx. But did you know that you can also explore the history of these ancient wonders by night? The sound and light show is a striking audio-visual show that not only makes for pretty pictures, but also acquaints you with the stories behind these mysterious structures. Do you know the story of the sphinx? Or about the intriguing lives of Queen Nefertiti and her rather unusual husband the pharaoh Akhenaten? 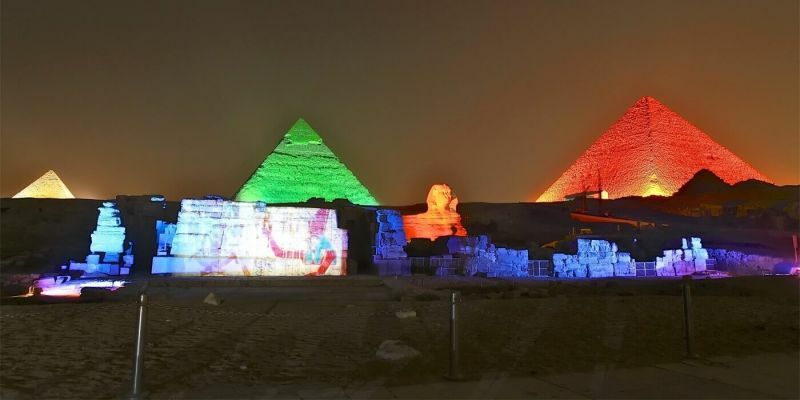 The pyramids sound and light show is a history class like no other, brought to life at the very spot where history was made. 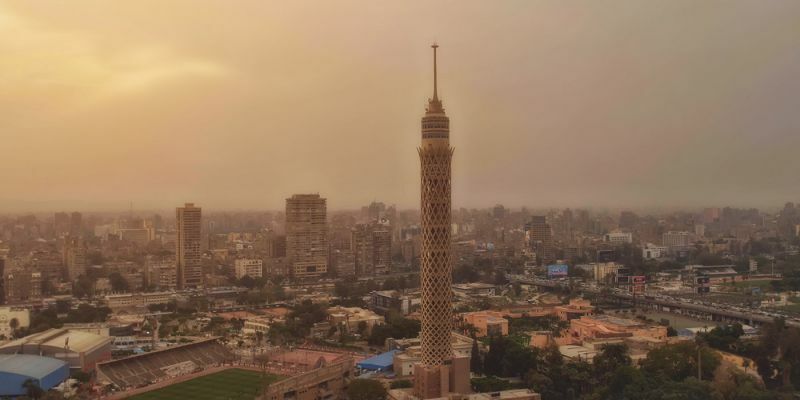 Cairo Tower is a famous landmark that was once the tallest building in all of Africa (until 1971). Standing 187 meters tall, it looms over the city, its concrete latticework exterior blending elements of both modern and ancient design. Needless to say, the tower offers breathtaking panoramic views over the city. Atop the tower, you’ll find an observation deck and rotating restaurant, ideal for admiring the sunset and watching as the city lights begin to shine through the darkness. You’ll gain a whole new appreciation for the sheer size of Cairo.